The question has always been and remains, 'How do they do it?' Van Canto brings their fourth work of a cappella metal, Break the Silence. Once more, excepting the drums, the band performs heavy metal using voice alone to express bass, synthesizers, piano, and guitar, including solos. It's all quite incredible, but when you watch a video, it sure seems like they pull it off. Yet, listening to If I Die in Battle, Dangers in My Head, or The Higher Flight, the execution of the 'guitar solos' seems much too precise. Who would believe the human voice was capable of such expression? Yet the solo on Higher Flight sounds like the singer is using a kazoo. Perhaps my incredulity was triggered by the masterful, and quite beautiful, cover of Manowar's Master of the Wind which features extensive piano. Again, it sounds to much like a piano. Is that exactness even possible? Otherwise, Van Canto's Break the Silence is quite entertaining. Their metal flavor is classic melodic heavy metal mixed with power metal. The best of which may be the cover of Sabaton's Primo Victoria. Though the flavor and melody remain, the arrangement differs to an interesting result. There are lighter pieces like the aforementioned Master of the Wind and Spelled in Waters. Something more akin to heavier melodic hard rock is found on the reinvention of Alice Cooper's Bed of Nails. With Master of the Wind, these are easily the best tracks on the album. To the original question, I suppose it should be left a mystery. Recommended. 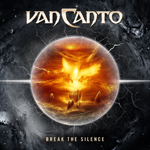 Van Canto's ability to create 'a cappella metal' still mystifies and entertains on Break the Silence.